History – Wool Knitting Yarn from Briggs & Little Mill Ltd.
Over 160 years of history! 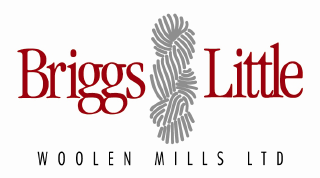 Briggs & Little Woolen Mills Ltd. has been the name of the woolen mill located in York Mills, NB, Canada, since 1916. Previous to that it was called Little’s Woolen Mills, and previous to that York Woolen Mills. The mill was first started in 1857 by George Lister who was one of the original grant holders in the Harvey area. Over the first 30-35 years the mill changed hands a few times. In the 1890’s it was bought by Roy Little, who ran it until 1916 when illness forced his family to move to the Prairies for a dryer climate. At this time the business was bought by Mathew Briggs and Howard Little, giving us the name, it has held to this day. Briggs & Little carried on under the ownership of these two gentlemen until the sudden passing of Mr. Briggs left half ownership to his son Russell. The younger Mr. Briggs continued on with Howard Little in the business until 1948, when Russell sold his share to a lifelong employee, Ward Little. Ward Little and Howard Little ran the mill until 1954, at this time Howard sold his shares to his son, Roy. These gentlemen ran the mill as partners until 1978 when Ward sold his shares to his grandson, John Thompson and Roy sold half of his shares to his son John Little. In 1988, John Thompson and John Little became partners. In 2014, John Thompson retired and Michael Little purchased 50% of Briggs & Littles shares. John Little and Michael Little, father and son, are currently the sole owners of Briggs and Little Woolen Mills Ltd. John working in the office and Michael running the mill. To date, the woolen mill has been operating for 161 years. In 2016, Briggs & Little celebrated 100 years of the “Little” bloodline. Currently there are three generations employed; John, Michael, and Michaels eldest son John-Michael and youngest son Carl, both of whom work at the mill. It has been re-built each time after 4 fires. The most recent being in 1994. The first colors other than white, grey, and black where introduced in the 1940’s and those included Scarlet, Royal Blue, and Paddy Green. Partially powered by water until 1994. Ward Little worked at this mill for over 60 years.